Wondering what that orange oval means? Well, take a minute and educate yourself. Safety is a key part of our business at Highland. We want you and the others around you to ride our mountain and have fun, but most importantly to be safe. Park Smart is the message we want to send to ensure everyone’s safety! Bottom line is — getting injured is not fun for you, us, or the people around you. Freeride mountain biking is sweet, but it is important to know your limits so that you won’t hurt yourself or others. We have some of the best riders from around the world descend on Highland to train and progress. Even the most advanced riders need to start small and work their way up. Have fun, be safe, and start small. Get SMART. We all know learning a new skill doesn’t always come easy. Highland has a group of instructors specifically trained in gravity riding. Taking a lesson with one of these instructors can be the safest and easiest way to learn the bike park terrain and its features. Bike parks are the most fun when everyone around you is having fun. So keep it cool, have respect for the others around you and everyone will enjoy themselves. Now that you know — let’s ride! 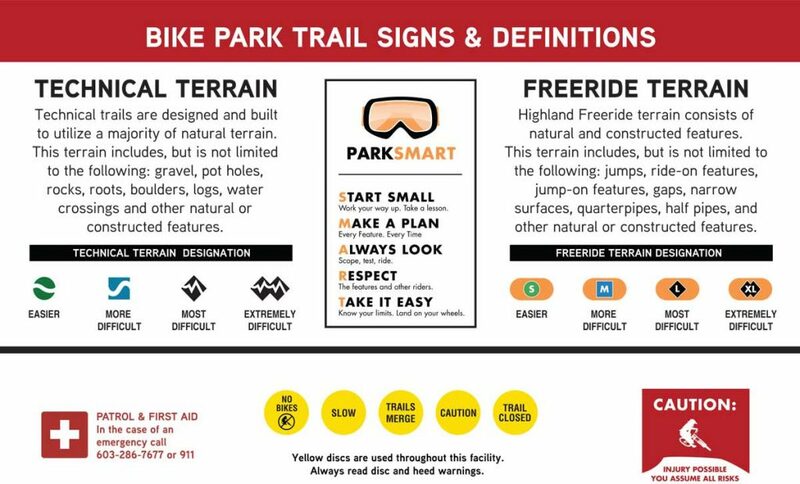 Park Smart is a safety initiative created to educate riders about freeride terrain. The Park Smart message is nearly identical to the Park Smart or Smart Style message developed by the ski and snowboard industry. The orange oval at the bike park designates freeride terrain and is usually posted at the bike trailhead.